The charming Trish Parry and gonzo William Glenn do know the origins of this drink. I had to spend weeks thereafter to confirm everything I learned from them. Apologies for the late review, but I like to make sure what they were saying are indeed accurate. The lesson is very good. As for their passion, it only works if everyone gets in on the act. They were certainly very enthusiastic on stage. I really had to wonder if they were actually drinking on the job. It probably did not matter, as the drunker they were, the hilarity would scale up. The show is more like a celebration than a journey on the starship they’re on. The loose plot which drives the show is powered by beer, of course, and it feels like it was taken from Legends of Tomorrow and the original Peabody’s Improbable History (aka Dreamworks Mr. Peabody and Sherman) than Magic School Bus. Little details connecting beer with certain sagas, namely the Finnish epic Kalevala was welcomed. I am not sure if the deets of women as the patron saints (sellers) of the drink are real. While I love the attention to Egypt as where beer first came from, I had wondered if they intentionally ignored what the Vikings loved to drink, mead (which is more of a wine variant). The Star Trek vibe felt a bit unusual. It was not fully played up and more could have been done with it, especially when Scotty had troubles putting a Klingon under the table. While the pop culture references to give this journey a nerdy appeal was cute, I thought it was ultimately unneeded. The time travel schtick is tricky to handle in a theatre environment. Perhaps a phone booth was needed. One key thing that would have earned a plus is in simply turning the cockpit around so audiences can see them than their behinds when traveling back in time. 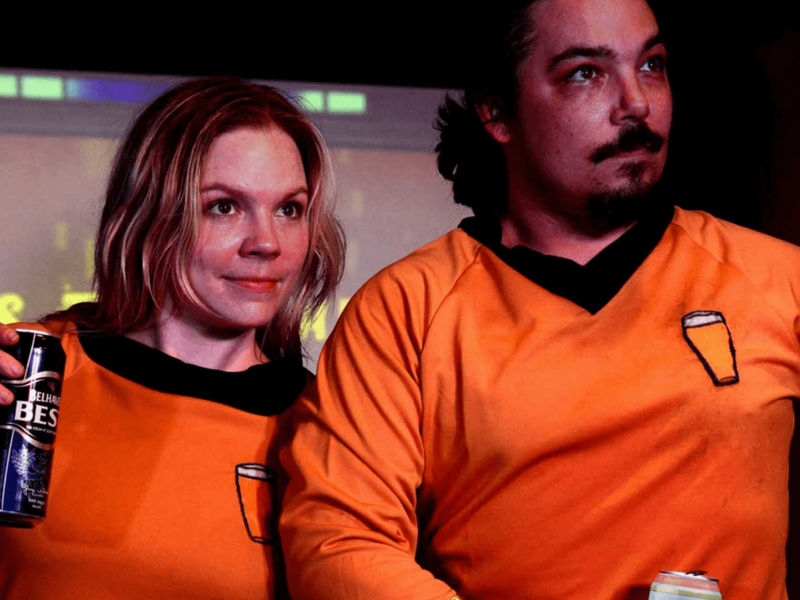 This entry was posted in Reviews, Theatre and tagged 2018, Beer, Comedy, Vancouver Fringe Festival, Victoria Fringe Festival. Bookmark the permalink.